On March 27, H.E. 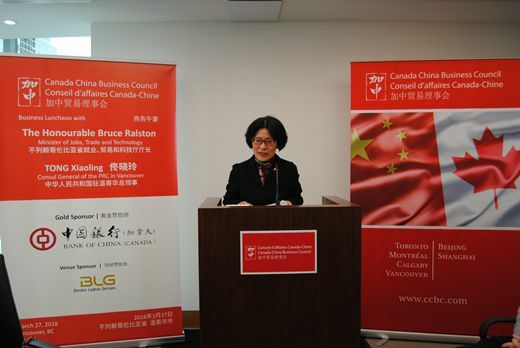 Tong Xiaoling, Consul General of the People's Republic of China in Vancouver, attended the business Luncheon held by the Canada China Business Council(CCBC) and delivered a speech about China's economic development and China-Canada economic and trade relationship. In her speech, Consul General Tong introduced the road map outlined by the 19th Communist Party of China (CPC) National Congress for the new era, in which China will remain committed to the new development philosophy, pursue green and high-quality development, deepen economic, financial and social reforms, encourage innovation across the country, and step up poverty alleviation. Consul General Tong briefed on the recent "two sessions"of the NPC and CPPCC, and highlighted the liberalization measures in the Report on the Work of the Government, which included slashing tariffs on popular consumer goods, relaxing control over market access to the service sector such as senior care, medical care, education and financial services, fully opening the general manufacturing sector to foreign investment while prohibiting compulsory technology transfers, and shortening the negative list for foreign investment. Consul General Tong also took the chance to promote the first China International Import Expo which will be held in November in Shanghai and welcomed Canadian businesses to the event. Consul General Tong pointed out that Chinese and Canadian economies are highly complementary. China's further development and opening-up will create more favorable conditions for the two countries to deepen cooperation, and hope that China-Canada cooperation can serve as a model for win-win and friendly cooperation among countries. Consul General Tong also expressed China's position and attitude towards the recent trade tensions between China and the United States, saying that China does not want a trade war with US, but is prepared to respond. The Canada China Business Council was founded in 1978. It is a bilateral non-profit organization with members from a wide range of sectors including large to medium-sized enterprises and non-profit organizations of both countries. Over the past 40 years, it's been devoted to the mutually-beneficial trade and economic cooperation between Canada and China. In addition to the head office in Toronto, it has five more offices in Vancouver, Montreal, Calgary, Beijing, and Shanghai.